In accordance with Order No. ISAK–2463 of the Minister of Education and Science of the Republic of Lithuania of 1 December 2009 “On the Approval of Description of Procedure for Organisation of Selection of the Director of the State Scientific Research Institute by the Way of an Open Competition” and Order No. 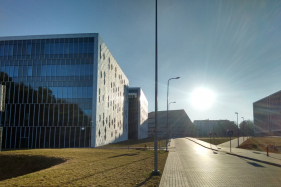 P1–333 of the Minister of Education and Science of the Republic of Lithuania of 20 November 2018 “On the Approval of Qualification Requirements for the Position of the Director of the State Research Institute Centre for Physical Sciences and Technology”, the Ministry of Education and Science announces a competition for the position of the director of the State Research Institute Centre for Physical Sciences and Technology. have good knowledge of several foreign languages, among them – an official foreign language of the EU. other documents enabling the objective assessment of the candidate’s qualification and compliance with the requirements (at the candidate’s discretion). Candidates should provide the required documents (or their translations) in Lithuanian language directly to the Human Resource Department of the Ministry of Education and Science no later than 21 December this year (inclusively) (address: A.Volano g. 2, Vilnius, room 108 or 107) on Mondays–Wednesdays from 14.00 to 16.00, Thursdays–Fridays from 9.00 to 11.00 or by email (signed by digital signature) smmin@smm.lt, or by registered mail addressing the documents to the Ministry of Education and Science A.Volano g. 2, 01516 Vilnius. In the event where documents have been sent by a candidate by email or registered mail, original copies of the documents must be provided upon arrival to the competition. For more detailed information call: (8 5) 219 1108, (8 5) 219 1170.